I pulled the Spidey in the coffin image from the first run of What If?, a series I remember fondly. I didn't know quite what to make of it when it first came out, but I knew I loved it. 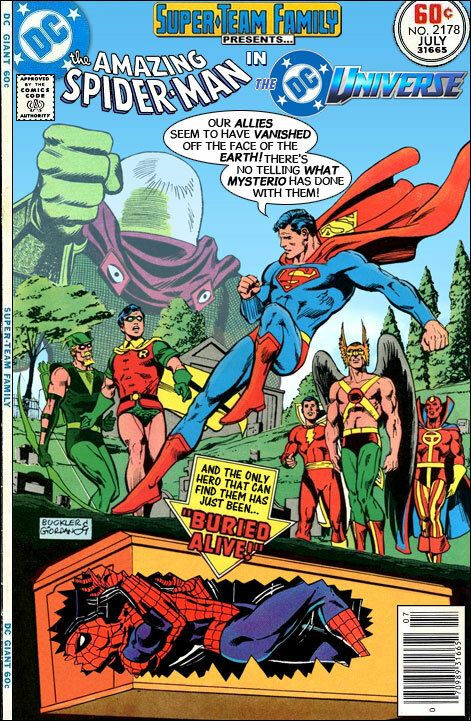 I had read a a few "imaginary stories" in the pages of Batman and Superman, but here was a whole series based on "what could have been" scenarios! The possibilities of such a title seemed limitless, and indeed is one of the inspirations for this blog. I think I remember that issus! It was based on the speculation "What if Kraven The Hunter had killed Spidey, instead of burying him alive?" In this case, Mysterio appears to have done that, after using one of those Nth-projectors Roxxon used on the parallel-Earth where HGW's Martians invaded a second time! "what if Spiderman held auditions for substitutes with good candidates like maybe Tarzan, to not so goods like George of the jungle and Quasimodo (Victor Hugo's version)? Ross, did you get the DC heroes from a single or multiple images? The only way I could see that grouping of characters would be from a TPB collection of DC Presents / Superman team-ups. They were all together on a World's Finest cover. hey i remember this cover of world's finest....batman was in the coffen....cool cover....then....cool cover now too....good work!!!! What If the original Marvel bullpen had been the Fantastic Four. Flo Steinberg as the Invisible Girl. Just looked it up on Mike’s amazing world. It was actually worlds finest 269. 269; 296; simple case of dyslexia. Nothing rome. Ross, Paul, et al: Thanks. I knew it had to be some kind of collection or anthology cover. I'd forgotten that World's Finest was an anthology book for a while during the inflation years -- I had just bought my first house back then and didn't have much left over for comics (I know, bad prioritization). Bought the issue so recognized the title. It reminded me of the old style comics with many features. The villain in Red Tornado was The Construct and I always thought him and Ultron would be a good pair to fight JLA/Avengers. I liked the idea of "What If" at first, but over time I felt like the answer to every "what if" question was, "Everyone would have died, that's what! Now shut up and be grateful it went the way we told you it did the first time."